On a similar theme to our last blog post about cakes to suit any budget, here we have a no expense spared Transformers themed birthday cake! This intricate cake cost £1,500, and we went all out to impress our client, and includes probably the most complex models we’ve ever had to create for a cake! 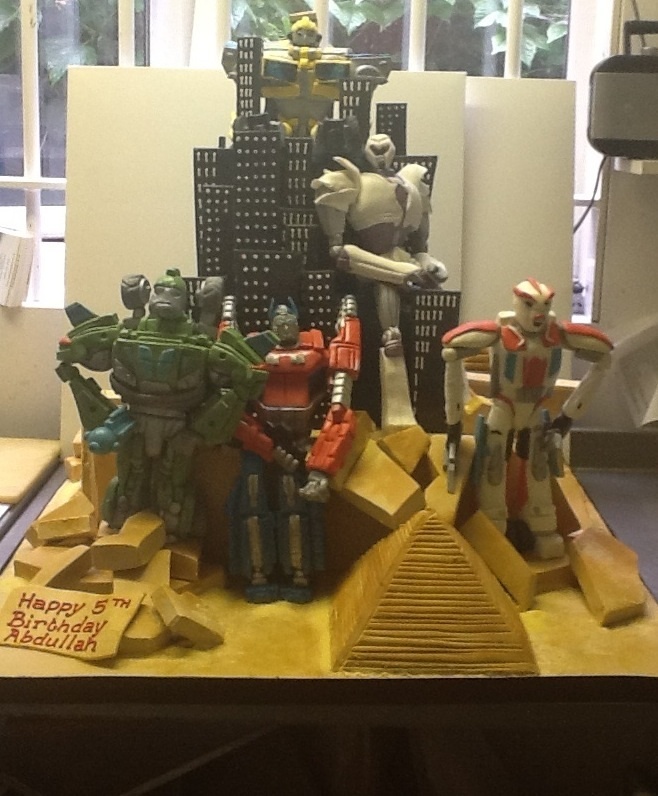 Our decorators put a tremendous amount of effort into crafting this incredible cake, which is based on the new Transformers TV series which has not yet screened in the UK. The design incorporates the Egyptian setting from the film, as seen in the sandy ground and pyramids, with the city skyline seen in the background also inspired by scenes from the film. This was a good way to add a bit more interest and make it completely unique, and it allowed us to work in more aspects from the film to make it even more impressive. The standout element of this cake is certainly the sugar models. These are all made individually by our highly skilled cake decorators, and it can take some time to make sure each one looks exactly how we want it to. It isn’t always easy, but it’s definitely worth it to see the delight on our customers’ faces. Much like the cake in our previous post, the Teenage Mutant Ninja Turtles birthday cake, this was based on a similar theme: characters in a scene, but it just goes to show that we can work with any budget to create something brilliant. We’re more than happy to discuss your requirements, and would love to see what we can come up with that will work with your budget!